Today marks the 136-year anniversary of the birth of Australian poet C.J. 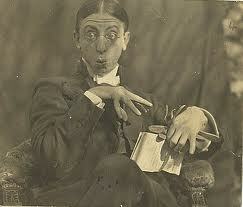 Dennis (7 September 1876–22 June 1938). Along with Banjo Paterson and Henry Lawson, Dennis was instrumental in popularising the Australian vernacular through fiction. Unlike Paterson and Lawson’s preoccupation with the Bush, Dennis is best remembered for his tales of the urban environment. C.J. Dennis’s most popular work The Songs of a Sentimental Bloke was first published in 1915. A hundred thousand copies were sold in its first four years, including a pocket ‘trench’ edition designed to be sent to Australian diggers fighting in the First World War. Dennis’s story would later be adapted into multiple film versions, a musical, a television program, and a ballet.